In my previous blog post, I discussed the basic TOF method for direct measurement of the speed of the light. In order to measure the time of flight accurately, we need to be able to both generate and detect very fast rising signals. One way to generate a fast rising, short duration laser beam is via an avalanche pulse generator as we discussed previously. In this blog post, we will take a look at the receiver end and conduct some experiments. A video of the experiment is included towards the end. One of the easiest ways to obtain a fast rising signal of the detected incoming laser pulses is to use a photomultiplier (PMT). Photomultipliers have excellent sensitivity and have very fast rise times (usually in the ns to sub-ns range). The photomultiplier used in this project was taken from an old PM2L color analyzer. It is an RCA 931. This PMT has a rated rise time of just under 2ns and has a peak spectral response at around 400 nm. Ideally, you could use a PMT with even faster response time and with a peak spectral response at around the wavelength you are interested in (in this case it is 650 nm as it’s the wavelength of the laser we are using). Nevertheless, this photomultiplier worked surprisingly well at detecting the 650 nm laser pulses with a red light filter even though the wavelength falls way out of its most sensitive spectral region. The circuit diagram below shows the actual detector circuit I used in the speed of light measurement experiment. The voltage divider resistors were changed from their original 3MΩ values used in the PM2L color analyzer to 1MΩ to increase the light current output and thus increase the detector sensitivity. Three capacitors at the last three stages of the photomultiplier are used to improve the output signal linearity for short duration signals and in our case, these bypass capacitors help to maintain an output light current during the short duration pulses. The current generated during these short pulses can be higher the current that can be provided by the resistor divider because of these capacitors and thus the sensitivity of the detector is also improved. For ideal pulse shapes, the load resistor should be 50Ω, which matches the output coax connection impedance. For this experiment though, I chose a slightly higher valued resistor (1KΩ) in order to make the generated load voltage larger for easy measurements. This nevertheless affects the output signal quality to some degree as you can see the ringing in the observed PMT output traces below. Other types of detectors such as PIN photodiode, avalanche photodiode (APD) and silicon photomultiplier for example can also be used as detectors for the TOF measurement but they are more expensive and all require expensive high bandwidth transimpedance amplifiers in order to achieve sub-nano second rise time. So an obvious advantage of using a standard PMT is that the output signal is strong enough to be observed without having to resort to an expensive amplifier stage. The method I used here can be made very accurate even with a measurement distance less than a meter. Because of the fast pulse edges, pico second time resolution can be easily obtained. Hi, I appreciate your blog and YT videos related to PMTs and such. Lately I dug out my ‘collection’ of PMTs, and started experimenting again. I’ve built a couple of scintillator setups, using a medical-surplus probe with NaI(Tl) scintillator, and a home-made preamp and peak detector, and an MCU to perform as a multi-channel analyzer. Details on request. Hi again, Just wanted to report that I made a “laser pulser” based on your design, and it works great! – The transistor I used has an Ampex private part number of 014-506. I don’t know what the equivalent JEDEC part is. I tried several parts, and most of them avalanche at 65-75 volts. – The storage cap is 18 pF. 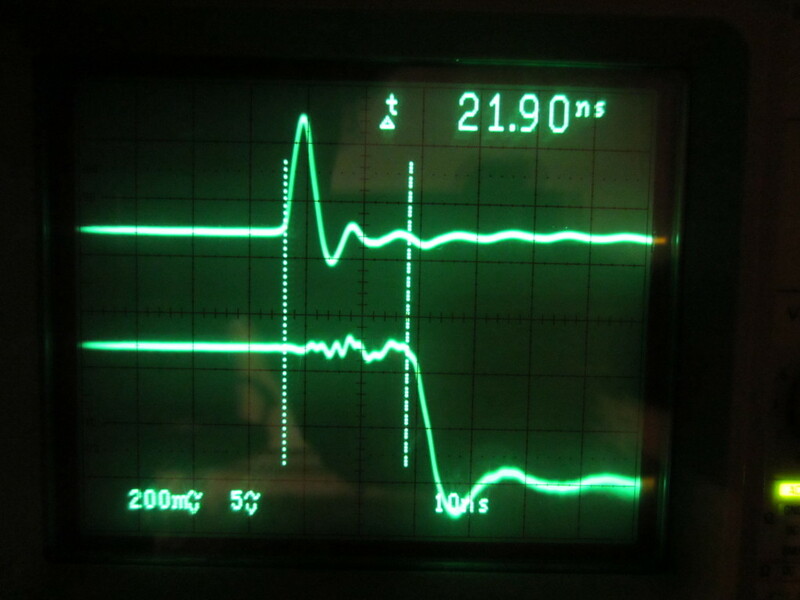 – I added an input BNC connector to allow triggering the pulse from an external source, such as my old HP 215A Pulse Generator. – I added a 1K+51 ohm divider across the laser, to allow monitoring the pulse electrically via a BNC connector. – I mounted everything in a small metal box. 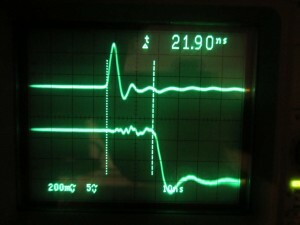 – I run the pulser from a bench power supply (HP, 0-300V). I’m making a PMT chamber with black ABS pipe. It has a 2 foot long 1.5″ tube, so that it can be easily “aimed”, and to reduce ambient light. Will mount a 931A inside it. Thanks for your comment Pete!